Acai Berry contains antioxidants which protect the body from the damaging effects of chemical reactions that occur naturally in the body. Research has shown that the Acai Berry has a higher antioxidant content than cranberries, raspberries, strawberries and blueberries (Health Tips and Lifestyle). Because of its antioxidant properties, there are many benefits to eating Acai Berries. 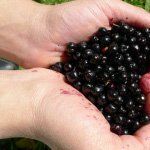 Some of these benefits include helping relieve arthritis pain, lower cholesterol, increasing energy levels, improving skin conditions and it also cleanses the body of harmful chemicals and toxins (Acai). Acai Berries contain omega 3 and omega 6 fatty acids which help to regulate the blood cholesterol contents and reduced the amount of bad cholesterol while increasing the good levels. It has also been found that Acai Berries can help regulate blood sugar levels in the body. There is little information regarding the side effects of Acai berry. However, if you are an individual who is hypersensitive to certain berries or has a pollen allergy, you should avoid ingesting Acai berry (Glenn). Additionally, Acai berry may cause pregnant women to have adverse side effects so it should not be taken. “Find a vitamin or supplement.” Acai. WebMd, 2009. Web. 18 Jun 2012. Glenn, Eric. Acai Berry Benefits and Side Effects. Ezine Article, 09/01/2009. Web. 18 Jun 2012. “Health Tips and Lifestyle.” Acai Berry Side Effects and Health Benefits!. N.p., 17/04/2012. Web. 18 Jun 2012.